A collection of items donated by local families. I would like to trace family farm of Woller family in Orbost district around 1940 to 1945. Could you please advise how to do this. Yours sincerely Lee Milbourne. Hello. I am trying find information on my husbands great grandfather Lewis Henry Hudson. It has been said by family members he joined a circus in Orbost possibly sometime in 1894. I am hoping to discover if Orbost had it's own circus or if there is any way of finding out if there was a circus in the town between 1894-1900. Any help would be gratefully appreciated. Thank you. Karen Harrison Orbost definitely did not have its own circus. I suggest that you have a look through TROVE newspapers to find any references to circuses coming to this area of Victoria eg. to Bairnsdale or Orbost. Would like to trace the Drossou bros. I'm after Marlo football photos for my Dad (John Francese). He and my Uncle (Charlie Francese) played for Marlo in the 50's.... The Francese family, Peter, Maria (buried in the Orbost Cemetery), John, Charlie, Mary, Pat and Joe ran 2 dairy-farms on the Marlo road. My Great-Aunt, Eugenia Chirico ran a boarding house in Orbost. I would love any pics or info! I was born in Orbost, 1961. I still have my infant welfare book!!!! I would like to hear from anyone who can inform me about the Orbost Gift, a sprint race which used to be held there. I would like to know if it was run in conjunction with the Agricultural Show and particularly what year it started. I know that a friend of mine won the race in the sixties. Hello, I am interested in the Rail History Exhibition I've read about in the March Senior newspaper. I have been researching my Family History for many years and my Grandfather, Albert Edward Carson worked on the Railway from 1914 to 1919. I have found him on the Victorian Electoral Rolls for the Division of Gippsland, Subdivision of Bruthen, working as a labourer and a navvy. I would like to attend your Exhibition in April. I would come on public transport and VLine and probably stay over night. Would you be able to tell me what accommodation I would be able get in walking distance to your hall, perhaps an hotel where I could get an evening meal. It sounds a very interesting exhibition and I would like to see it. Patricia Bates, RSL Village, 66 Sage Drive, Frankston South 3199 PS. I didn't know where to put my email. 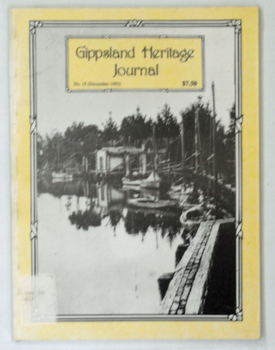 Gippsland Heritage Journal is a journal, produced about every nine - twelve months, for those interested in regional, local and family history in Gippsland, Victoria, Australia. It is compiled by Meredith Fletcher, Debbie Squires and Linda Barraclough and includes a diverse range of articles, both academic and non-academic. Since No.24 it has been a partially refereed journal. This copy was used in the library of Orbost Secondary College. This item is a useful reference tool for the history of Gippsland. 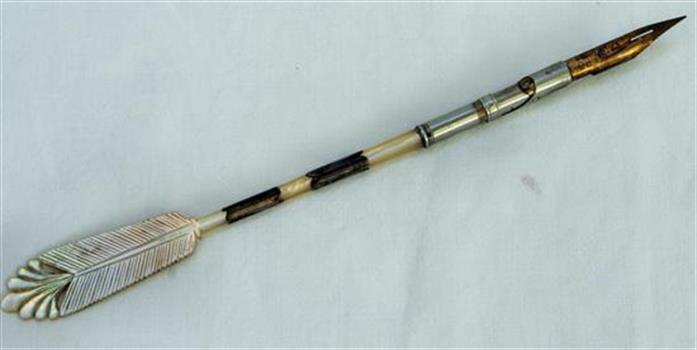 A pearl-handled pen with the end in the shape of a feather. It has metal pieces along its length. There is a copper nib and a silver nib holder. 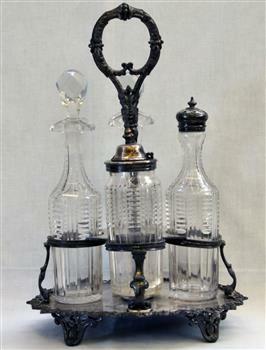 An early Sheffield plate stand with four glass decanters. Two with silver lids and two with glass stoppers. Tray has very ornate design. A cruet also known as a caster, is a small container to hold condiments such as oil, vinegar, mustard, pepper. Its shape and adornments will depend on the specific condiment for which it is designed. Cruets were made in silver, silver plate, ceramic and glass, and sometimes a combination of two materials, usually as a glass body with a silver or silver plated top. 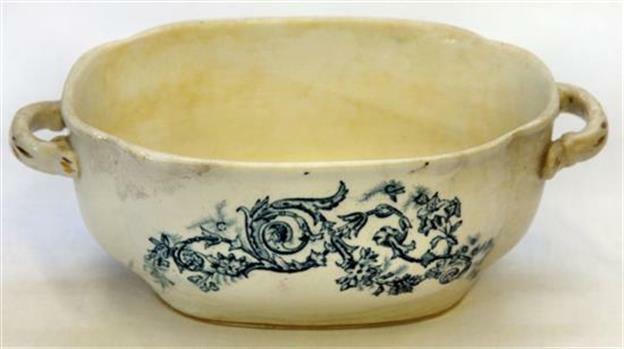 This item is an example of domestic tableware commonly used in the early t0 mid 20th century. A roughly made wooden cutlery tray/container made from a recycled dried fruit box. It has a leather strap handle attached to the divider. ITtis divided into two rectangular compartments. With it are 14 items of cutlery. There are 6 knives, 6 forks and 2 spoons. 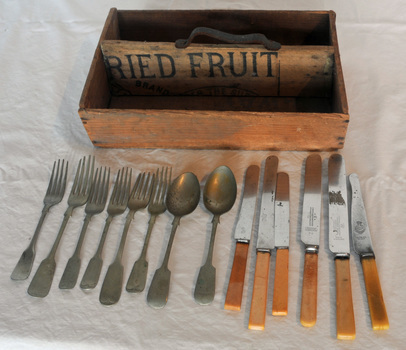 The spoons and forks are all silver and the knives are stainless steel with bone handles. This item is an example of the self-reliance needed by families during hard times. Many household necessities were made from available materials. 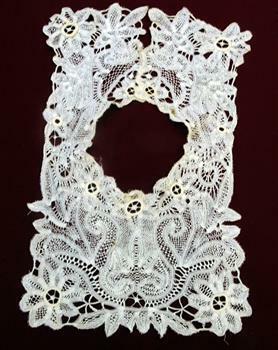 A large white cotton lace collar, roughly rectangular in shape, made from tape lace and with decorative infills. This collar is very pretty and beautifully made. Mrs John Draffin was the wife of a Shire President of Orbost Shire Council. She is reported to have made this lace herself. The design might have been copied from a book of laces. Associated with the wife of an early resident of Orbost who was Shire President. 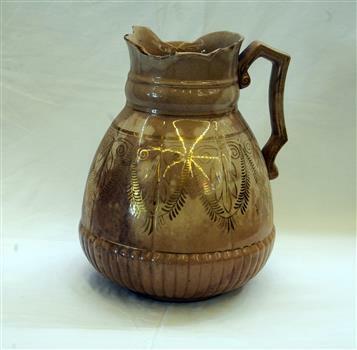 Large ceramic bedroom water jug, Beige in colour with gold enscribing. Rim is scalloped. 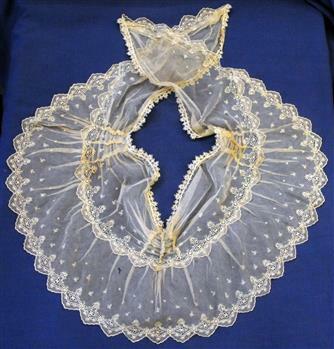 This is an example of a late 19th century item commonly found in a bedroom of a comfortable home. 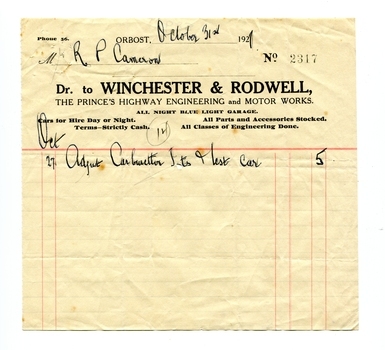 A white paper account with black print and red lines.It is from Winchester & Rodwell, Engineering & Motor Works to R.P. Cameron. Winchester & Rodwell was an engineering and motor works opposite the Commonwealth Hotel in Orbost. It was the service station for General Motors products as well as the official R.A.C.V. service station. Robert Pullar Cameron was a Shire Councillor for many years. He married Penuel Hossack and had a family of James, Flora, Penuel and Alex. This item is an example of the book-keeping of an Orbost business in the early 20th century. It is a useful research tool. Fully beaded drawstring bag with designs of flowers. Tassel of beads attached to bottom of bag. Small wooden hooks on the inside to hold black rope drawstring. 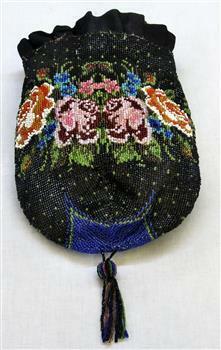 Pretty and tiny beaded bags and purses were highly decorated to match the dresses of the era. They were small enough to carry makeup compacts, a few coins, and they were fashion accessories more than practical handbags. 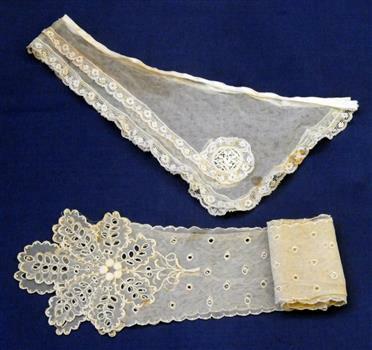 This item is an example of a clothing accessory used by women in the early 20th century. China dish used for gravy, sauces etc. White with gold edging on handles and around base. Blue floral pattern on front and back. 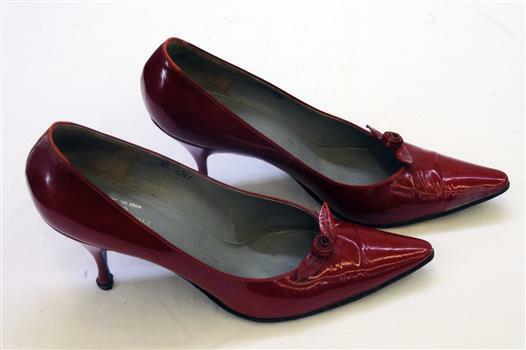 A pair of deep red patent leather women's shoes with pointed toes and thin heels. The front of the shoe has a decorative small rosette and leaves. These shoes were called "winkle pickers" because of their pointed toes and came into fashion during the 1960s. These were probably worn by Mary Gilbert and donated by her. Mary was a well-known Orbost teacher and historian. These shoes have a personal association with Mary Gilbert from Orbost and are also typical of the fashion of the 1960s. 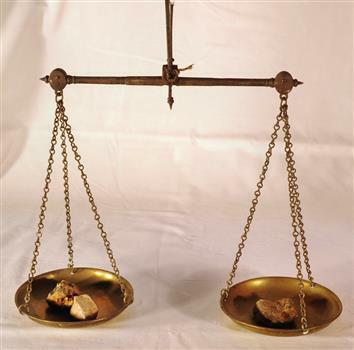 Gold assayer's scales, a very sensitive balance used in the assaying of gold, silver, etc.The scales are comprised of two circular brass pans suspended via brass chains to a metal balance. This item is a significant item which is part of the history of gold mining in Victory. 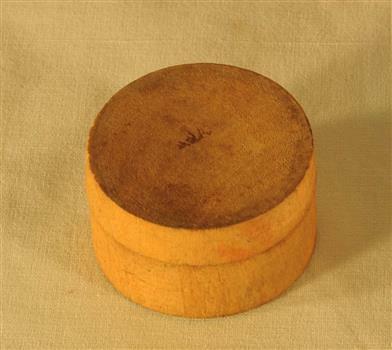 Small round wooden container with candle inside. A coffee-coloured lace bertha collar which is wide, round, flat collar designed to accent a woman's shoulders. It has a long history stretching back to Victorian fashion. It can be worn as an accessory to a dress or a top, and it is sometimes removable like a shawl. 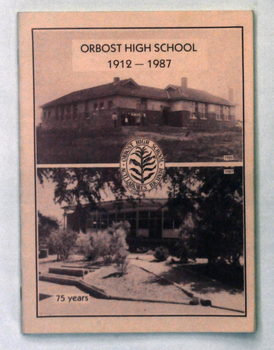 Two copies of a 48 pp magazine titled, "Orbost High School 1912-1987". It has a pink cover with two photos of Orbost High School - 1925 and 1987. In the centre is the school badge. This magazine was produced for the 75th anniversary of Orbost High School. 2238.1 belonged to Mary Gilbert. 2238.2 belonged to Ruth Legge. Orbost High School / Orbost Secondary College has played a significant part in the education of senior students in the Orbost district . It is the sole senior educational institution. This item is representative of its history. It is a useful reference tool. 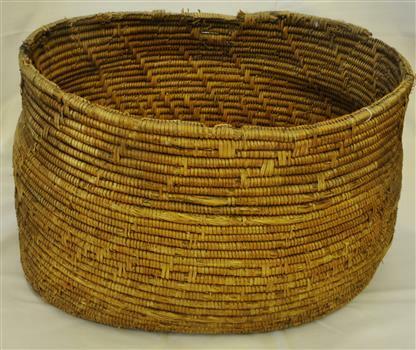 Large handmade woven Aboriginal basket. Made as wedding present for Cameron, John (Mrs) in 1880 at Lakes Entrance. John Cameron (1847-1930) selected first land on Snowy River flats. Married Elizabeth Roadknight (1863-1939) who was born in Cunninghame (now Lakes Entrance). This item is associated with the Cameron family who were early Orbost settlers. 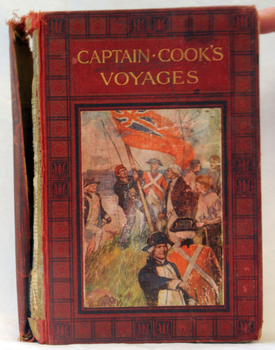 A 446pp hard back book titled, "Captain Cook's Voyages" in gold print. It has a black and red cover with a coloured illustration of the landing of James Cook, his crew and the planting of the British red ensign. It has coloured illustrations. Includes Aboriginal encounters with explorers. James Cook was a British explorer, navigator, cartographer, and captain in the Royal Navy. Cook made detailed maps of Newfoundland prior to making three voyages to the Pacific Ocean, during which he achieved the first recorded European contact with the eastern coastline of Australia and the Hawaiian Islands, and the first recorded circumnavigation of New Zealand. Cook's 12 years sailing around the Pacific Ocean contributed much to European knowledge of the area. This is a useful reference book. inside cover - :To Fred from his mother, mas 1910"
A large magazine. The cover has a red background with a large picture of the royal coat of arms and regalia. The title is in blue print at the top. At the foot is CORONATION WEEK DOUBLE in blue print. In smaller black print is Cost 4/-. 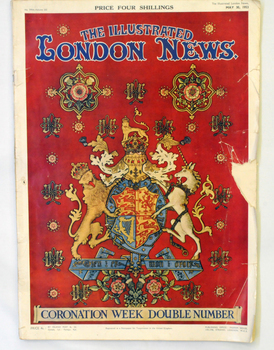 This special issue was produced in conjunction with the coronation of Queen Elizabeth 11. On the 2nd June 1953, the coronation of Queen Elizabeth II took place and the commonwealth countries, including Australia joined in the celebration. Two lace collars made of coffee-coloured lace. .1 has an edge bound with tape. .2 is a rectangular strip. Two knitting pattern books. Both are black / white and contain knitting patterns. 821.1 cost 7d, is titled "Patons Specialty Knitting Book No. 145" and has on the front cover a lady standing near a buggy wheel. 821.2 cost 1/3, is titled " Patons Knitting Book No. 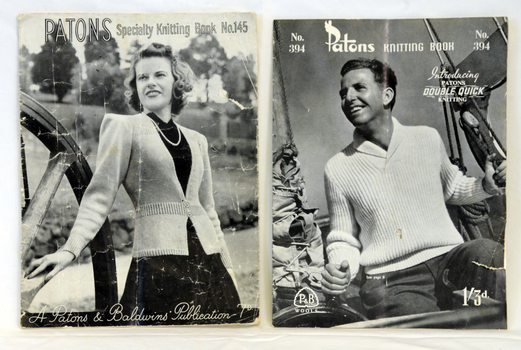 394 (introducing Patons Double Quick Knitting)" and has has on the front cover a photograph of a man on a boat. These knitting pattern leaflets were published by Patons and Baldwins and contain knitting patterns for women's and men's garments. Patons & Baldwin began as two separate companies: J & J Baldwin and Partners, founded in the late 1770s by James Baldwin of Halifax, West Yorkshire, England, and John Paton Son and Co., founded in 1814 by John Paton of Alloa, Scotland. Both men had formed their businesses using the spinning mule developed by Samuel Crompton. They mainly produced yarns for commercial knitting machines. Patons established itself in Australia with its first mill built in Tasmania in 1923. For decades, Patons was the leading hand knitting yarn brand but due to the market conditions in the mid 1980's, Patons felt the decline and eventually amalgamated with Alliance Textiles, New Zealand in 1996. Patons Australia was acquired by Australian Country Spinners in 2000. Knitting has always had a great appeal to women, as it needs few tools. Companies which manufactured yarn often produced instruction guides and patterns. These pattern books are typical of the knitting pattern books commonly used in the mid 20th century. The patterns contained are for garments commonly worn at that time. 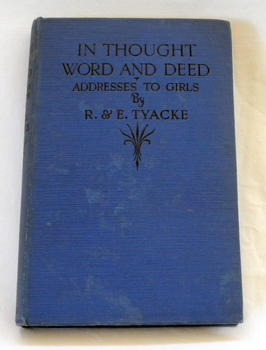 A blue covered book of 95 pp, titled In Thought Word and Deed Addresses to Girls. It is written by R. & E. Tyacke. Inside the frontispiece is a sticker of a clown playing a trumpet. This book is an example of one of the early books for children which could be didactic and meant to improve the child's moral and spiritual life. A pencil (?) 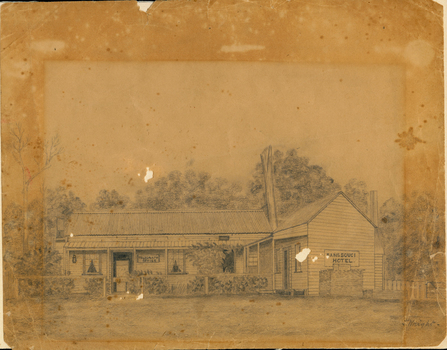 drawing of the old Sans Souci Hotel at Upper Bemm River, near Club Terrace. It is a one storey timber building. The drawing has been framed at one time causing differences in light damage. The original licence for the Sans Souci Hotel was granted to A. G. Ventry in 1909. The hotel burned down on 15.06.1923 and was rebuilt. It burned down again in 1936 and the licence surrendered 21.12.1936. with the owner compensated with 475 pounds and the occupier 50 pounds. (info Victoria Government Gazette Thursday December 24 1936) The hotel was at Upper Bemm River near Club Terrace in East Gippsland. This item is a contemporary pictorial record of a building which was once a popular destination for adventurous tourists in the early 1900's. There are few photographs of this hotel. A metal stencil for use on bean or maize bags. It is rectangular with rounded corners, Cut out is "F.W. WARREN ORBOST"
this was used by Frank Warren at Bete Bolong / Newmerella. The Warren Brothers had a farm on the Bete Bolong road at Newmerella. They grew beans, peas, maize and pumpkins for export to Melbourne (by train) until the 1970's. 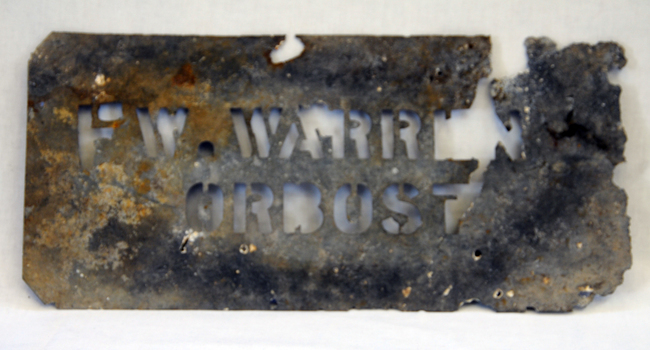 This item is significant because it was specially made agricultural produce in the Orbost district, a major industry in the first half of the 20th century. 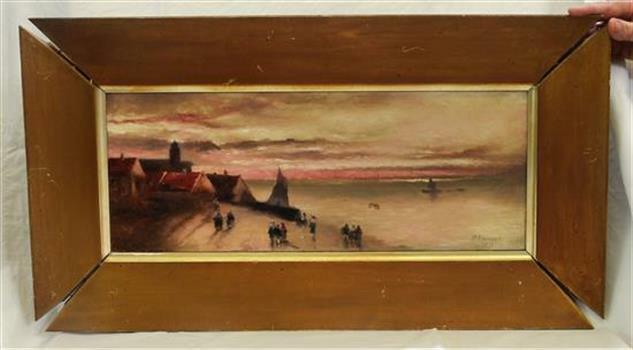 Picture of small village by the sea with passersby. In all gold coloured frame. The painting was created by Mrs M. Bazeley who was the wife of the current Church of England minister and the mother of Dr Percival Bazeley, born in Orbost (1909) who was credited with assisting Dr Jonas Salk who produced the polio vaccine. This item is an example of the artistic talents of many women in the early 20th century. It is of aesthetic significance. 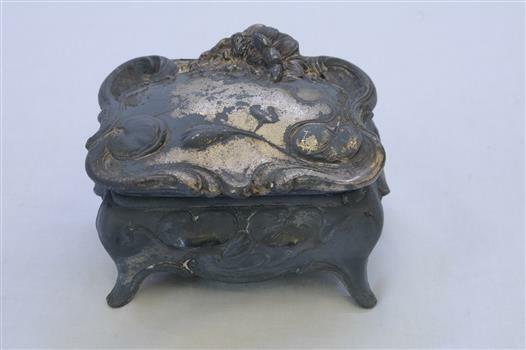 Small Sheffield plate trinket box, ornately decorated. Has hinged lid and light blue lining inside. 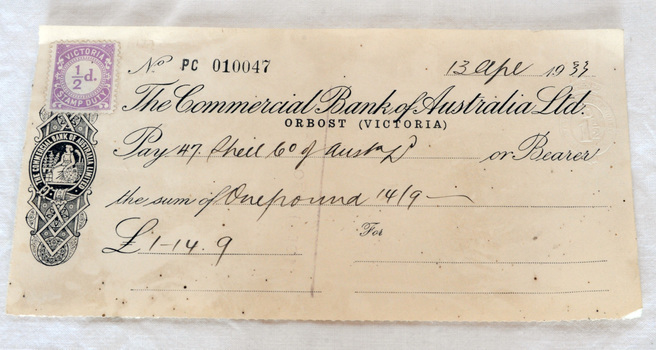 A paper bank cheque from the Commercial Bank of Australia. It is made out to Shell Co. of Australia for the sum of £1-14-9. It has a purple ½d sta½mp duty in the top left hand corner and an embossed 1½d on the right hand side. The cheque is unsigned. A small hand-operated sewing machine. The body of the sewing machine is painted black. The top arm appears to have been painted in a white/cream colour. The machine could have been used to make small articles. There is no bobbin. This machine was given to Ada Healey as a child. Ada Healey was for 20 years a volunteer and organizer at the Orbost Slab Hut (Orbost Information Centre). She was known for her craft skills and was a particularly fine knitter. Ada was the only child of Tom & Queenie Warne, born in Bombala/Delrgate. She was married to Keith Healey. The Healey family were early settlers in Marlo. This is an example of a toy given as a "teaching" toy. 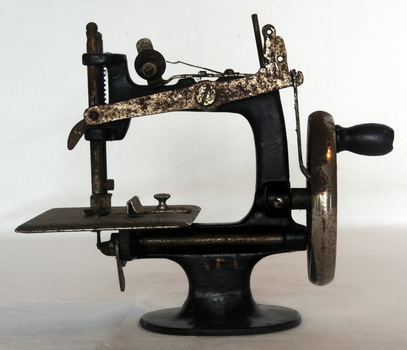 It was used by its owner to practise sewing before graduating to an adult type machine. A thick, hexagonal shaped pencil made of wood, painted dark blue, containing blue graphite marker. Used by Victorian Railways at stations on the Orbost-Bairnsdale line. The Bairnsdale-Orbost railway was opened in 1916 to serve the agricultural and timber industry. Because of the decline in traffic and heavy operating costs, the line was finally closed in August, 1987. Orbost Railway Station was opened on Monday 10 April 1916 as the terminus of the Orbost railway line, and closed in 1987. The station was located on the west side of the Snowy River despite the town of Orbost being on the east side of the river, in order to save on the costs of a bridge over the river, which at the time had highly variable levels. 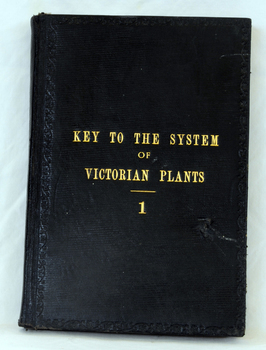 A black book with the title "Key To The System of Victorian Plants 1" in gold print. Mueller was one of the first people to take a scientific interest in Victorian forests, and argued against indiscriminate clearing of land. This item is a useful research tool. It is associated with Carl Grove, a prominent early resident of Orbost. inside cover - "To Carl Grove from Baron Von Mueller March 1896"
A rectangular book with a dark grey/green cover which is padded. The word AUTOGRAPHS is stamped in gold on the ront cover. The inside covers are marbled and the pages are gold edged. 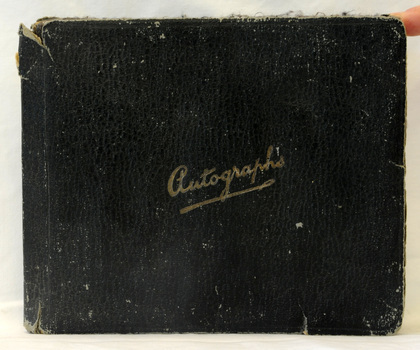 Inside are autographs of early Orbost residents, sketches and comments. 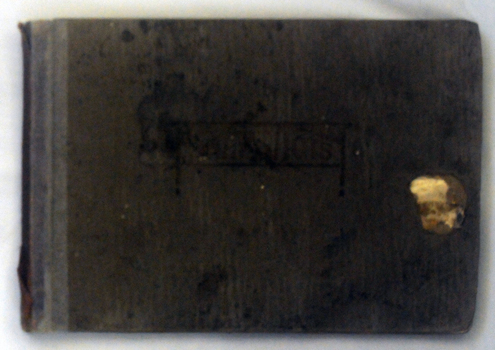 A rectangular shaped album / scrapbook with a dark grey /brown cardboard cover and grey pages inside. The spine is black leatherette. It contains photographs, newspaper cuttings, magazine pictures which have been pasted in. This album was a display item at the Slab Hut (Orbost Information Centre). Scrapbooks are a reflection of an individual's interests and stories and are often meant to be passed down through generations. They can be a useful research tool as they reflect contemporary interests.